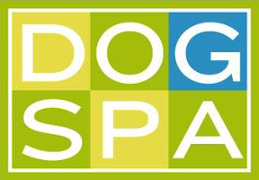 At DOGSPA, we treat every one of our dogs with the same care and consideration that you give them at home. All of our staff are professional pet care specialists, trained in the art of grooming as well as pet first aid by the American Red Cross. Two HydroSurge baths, using only the finest natural shampoos, conditioners, and treatment products. Styling your dog to the breed profile, while respecting your specific requests. Removal of mats from the coat and skin. Use of scissors over clippers when possible. Our grooming turnaround time is typically between four and six hours, due to the use of cool dryers only, and our attempt to create the most relaxing and positive experience possible. 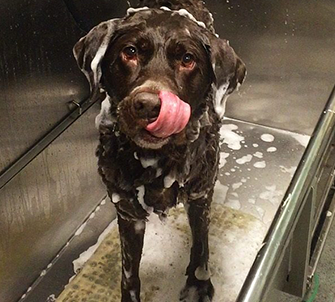 We try to match the appropriate groomer to your dog and maintain that relationship with each return visit. We book appointments Mondays through Saturdays. Nail trims and grinds are walk-in services offered on Tuesdays through Saturdays, from 9:00 a.m. to 3:00 p.m.
Our pricing is based on breed and subject to change. We require a hard copy of your pet's rabies document prior to grooming. You'll be pleased to know all cages meet the highest safety standards. Our grooming tables come with anti-fatigue matting and are height adjustable. Our tubs are equipped with a HydroSurge spa bath to minimize stress and maximize cleanliness of your dog's skin and coat. Your dog will always be treated with the greatest care. Every tub features and entry and exit ramp so there is no lifting or jumping by the animal. Our soundproof kennels provide a quiet, soothing atmosphere by minimizing harsh sounds.